Tom George « HOLLIE GREIG etc. http://StolenKids-HollieGreig.blogspot.com were imported upto 03-Mar-2010. It has been established beyond all reasonable doubt that the STORIES surrounding allegations of abuse of Hollie Greig are a dishonest and malicious hoax promoted by Anne Greig, Robert Green, Stuart Usher and others. I freely admit I was conned into support of the claims, based upon lies and promises of evidence that never materialised. I apologise to anyone who may feel they have thus been defamed by my error. TOM GEORGE FAE BEYOND THE GRAVE! I had to stand down from Hollie’s case when my health could no longer withstand the two-faced back-stabbing and when it became obvious that the “stories” put forward by Anne Greig and Robert Green were a crock of s**t.
I was involved in the very earliest stages long before the campaign was hijacked by self-serving egomaniacs like Paul Dorkton, Steven Milne, George McKendrick and Matt Quinn with their false identities, fawning neophytes and threats of violence. I cannot even begin to tell the story of the truly horrendous abuse I suffered at the hands of these evil people. I know that I was not the only person vilified by the braying mob for trying to tell the truth and to stand up to the bullies on Facebook. Others like yourself, Pabs, Greg Lance-Watkins and Lesley McLaren suffered the same fate. It has been established beyond all reasonable doubt that the STORIES surrounding allegations of sexual abuse of Hollie Greig are a dishonest and malicious hoax promoted by Anne Greig, Robert Green, Stuart Usher and others amongst their perverse cult following. I freely admit I was conned into support of the claims, based upon lies and promises of evidence that never materialised. I unreservedly apologise to anyone who may feel they have thus been defamed by my error. 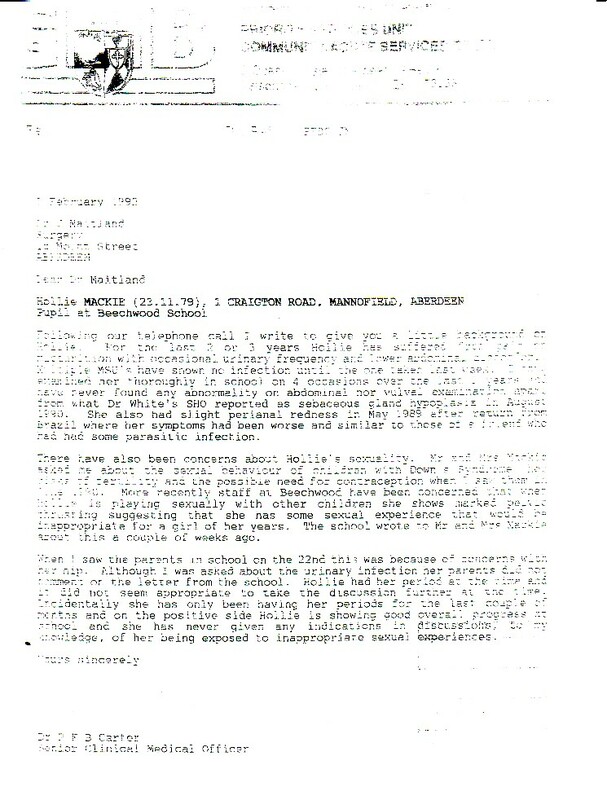 here is a series of postings that go a long way to endorsing my exposure of the Hollie Greig case, as a pack of lies and self serving fantasies, by scoundrels and their naiive supporters; commencing with a letter from one of the early activists who was villified from the moment he exposed the truth that the stories about Hollie Greig and those surrounding her were nothing but stories and lacked a shed of admissable evidence or evidence of any credibility. Thank you for your kind words justycI had to stand down from Hollie’s case when my health could no longer withstand the two-faced back-stabbing and when it became obvious that the “stories” put forward by Anne Greig and Robert Green were a crock of s**t.
perhaps before people start jumping up and down over this story they should actually research ALL the information being given. There are far too many unanswered questions which Robert Green and Ann don’t want to answer and none of their rampant followers question – instead they label you as one of ‘them’ or a pedo supporter. Why was Ann seeking contraception for her daughter WITH her husband? Why Hollie, (who we are repeatedly told never lies), when asked on a filmed interview if her she was afraid of her father killing her dog, she said no. Why does Ann’s story change when she’s telling it? Why were some of the named victims not even born when the alleged abuse took place? Why are all those accused people that Ann has had a falling out with? Why does her son say none of it is true and why has she not contacted him despite his public appeals to? Why do they continually lie about what happened with the BBC reporter Mark Daly and themselves – Mark Daly even called into a radio show that was interviewing Robert Green to set the record straight. None of this you will hear from the supporters – they are blinkered to any other interpretation other than that which is spoon-fed to them by Robert Green (Ann having been taken as far as the High Court in London to be told to shut up with her lies or they will take Hollie away from her). You will be banned from their little groups if you ever question the story and labelled as a spy, traitor, hacker, pedo etc for simply pointing out the many inconsistencies in the story. This would all of course come out in court and if Mr Green or her mum is lieing then fine them or lock them up. The goverment have tried every trick in the book to silence the family and trying to discredit the source is normal procedure. I find it very hard to belive they would be so stupid as to accuse people that were not even born when the crimes took place myself and even someone with a low IQ like Hollie could dream up a better story. Actually I dedicated my own website solely to their campaign at first and i had all the paperwork available for download on it as well as all the available interviews they gave. I was also one of the admin on the 27000 member facebook group so i do know what i am talking about. I went from someone who blindly believed her story at first (because they are very convincing, to actually finding the time to read ALL the available material and seeing that it didn’t add up. When I started to question the glaring inconsistencies, they turned on me and several others who were also doubting the ‘truth’ of their story. All the proof you need is in the documents they made available and from Mark Daly’s mouth (who I also spoke with). He was initially interested in covering the story at first till he started investigating it for himself and soon found out that not all that Ann and Robert tell you is truthful. Call the BBC and speak to him. Look up the medical condition ‘Folie à deux’ and you will understand what is going on here (only on a bigger scale with their supporters. Ask the Hollie team for all the available documents that Ann and Robert have put out, read them for yourself with an open mind and then come and tell me you have no doubts about their story. You can infer all you like about propaganda or whatever, (i’ve had it all and more said about me after i started questioning her story already), – i’m just telling you what i went through and why i changed my mind over this story. Stop blindly believing everything the Hollie team are telling you. Do your own research because they certainly don’t. They don’t even bother read the evidence presented to them in support of Hollie because if they did they would see it’s full of holes. Much respect for looking into this case more than myself. I can except your word for it that the family side of the story has some contradictions but i still feel from what i have seen that this case should still go to court even if the result is the guilty/inocent people get to clear their names and its fair to think the state knows the people it is trying to protect are guilty. Why did she get a £13,500 payout if no crime has been commited and did they realy need to send men in white coats to try and silence Ann. Regards and i will look in to what you have said if you can provide links please. Having spent much more time than you over this, I have to disagree that this case should go to court – it would be laughed out of there in seconds. If myself and others can pick Ann’s story apart then what will a trained lawyer do to it and her? Do you really believe that anyone can make wild allegations about 30-odd people with not a shred of evidence and that it should go as far as the courts? Don’t you think some of it should at least be provable first? Like how Ann never mentions in any interview that she claims she and Hollie were being poisoned by a nurse/relative who was giving her husband the poison as they were having an affair – even when they were in the shelter. They were also following her all the time. How her finally leaving the house for the shelter has 2 different versions. How her son claims she abandoned them several times and went missing from the house. How her house was bugged. How the hospital has no record of her ever being admitted. How in all this time, she never saw any signs of abuse in Hollie and Hollie (who we are told can’t lie) never told anyone she was being abused. Nobody else saw any signs either and she was examined regularly. Why robert green won’t allow the taped conversation between him and mark daly to be made public. How the police complaints commission has twice (as i understand) failed to find any evidence or truth in Ann’s claims whatsoever (you can view the entire findings of one time here – PCC findings ) That’s one document that I discovered myself – it’s not one that they want you to know about for obvious reasons. Most of the documents they provide are very poor, illegible photocopies (like they can’t access a scanner anywhere to make decent scans of all the originals that they claim they have). There is so much more i could go on about but i’ll leave you to ponder that lot for now. As for the money she was paid – it was most likely decided that as there is no way they can prove what happened and felt sorry for her so gave her the benefit of the doubt. Paying her in no way implies there was any proof of abuse. Robert also had the opportunity to take this all to court last year and he lied to his team when he said that he had filled in the paperwork to do so – he never did and that was the one chance they had that it could have gone to court. The last thing they want is for a court case to happen because all of this information and more will then become known and picked apart. Much better to travel the country telling tales to anyone that will listen and getting away with it. It is ‘possible’ that Hollie was abused by her father (though this is never ever going to be provable in any court and any hope they had to take it there is now spoiled by the lies) but i don’t believe that there was ever a pedo ring involved. i think Ann is mentally unstable and concocted the whole story after she started investigating the money she thought she would get from her brother’s estate. It seems everyone who she came across in connection with it (lawyer, bank manager, police etc) suddenly became part of this ring which grew larger as her story did. Indeed anyone that opposes the story gets accused of being part of the coverup. like i mentioned before, robert green is her folie a deux partner. The only interview they have ever given where the story was questioned publicly (mark daly), robert green refused to talk to him! You can listen to the whole thing here – please listen to all 6 parts All the other interviews have gone along with it hook, line and sinker without questioning anything, investigating any of it or reading any of the provided documents. …and that came straight from the mouth of the man who’s job it is to issue them. if i ever find his letter again i will post it here. adding the text of the letter …..
Let me assure you that no Defence Advisory guidance has been issued on the case of Hollie Greig, nor will it be. The DA Notice System covers only the core national security issues defined in the five Standing DA Notices. These are of course purely advisory and are not supported by any form of sanction, legal or otherwise; advice offered under them can be accepted or ejected in whole or in part. For full details see http://www.dnotice.org.uk. The case of Hollie Greig falls far outside the DA Notice System guidelines. and whether or not certain people are treating this case as a ‘no-go area’ it is certainly not because of any DA Notice concerns. HOME & MOBILE PHONE REDACTED G.L-W. I tried to read the details in the doctors link you posted but it’s a picture of a document and i can not make anything out. Whats the connection to a vice air marshall who sent the message in your post. I don’t think Hollie having a boy freind makes less of a case myself and few two people will tell the same story word for word perfect so no I don’t think the case would be laughted out of court and if the finger was pointed at me then i would welcome a court case. it’s hard to prove documents have gone missing if they have gone missing and Mr Green does seem to keep a copy of a lot of documents and makes them open to the public. not saying you can not find fault in the case but it sure looks like people can fault the defence case and can see that the case is being blocked from a very high level. I thought about a nice, long reply to your post answering all your questions and providing even more information and PROOF of things for you, and then I thought why should I bother? If you can’t be bothered to use a simple zoom feature on THEIR document that I provided for you, take the time to listen to an audio recording which is extremely enlightening, read a very long and detailed official police investigation report, then whatever links I provide will be equally ignored in favour of your flippant comments – indeed, that is the case with most of the remaining die-hard supporters of this story. Facts don’t interest them. Ann’s own various versions of her own story don’t, Robert’s lies go straight over their heads and nothing you can show them will change their minds regardless of how damning to the case it is because they have already made their minds up already based on what they have been told – so eager are they to believe in a vast and frankly unbelievable sinister conspiracy involving everyone who dare doubt or question the story. You can’t even be bothered to look up what a d-notice is and why I mentioned it. I’ve wasted too much of my life already over this case and as you have already made up your mind as to what the truth is then no amount of posts by me to show you things you don’t know about will satisfy you, and as you can’t even go the tiny extra inch to look into any of what I posted – what is the point of me posting them. Just carry on believing the ‘official’ story because the truth of it isn’t important to you. In response to the comments made by “justyc”, I attach a copy of Robert Green’s blog which is the most comprehensive source of info on the Hollie Greig case. Many thousands of people have heard the Hollie Greig story and those who comprise the opposition are so few that they could be counted on the fingers of two hands. To correct just one of the factual errors made by “justyc” the other persons named by Hollie as victims were born betweeen 1975 and 1990. We can only look at the facts and draw our own conclusions. The only interpretation of the facts which is remotely credible to me is that a massive cover-up is ongoing. Perhaps if the politicians and mainstream media ended their silence some light could be shed on this case. hello stevenmilne (aka john taylor). here is my challenge to you…. how about instead of posting a link to robert green’s blog where he ‘says’ a lot, you post instead a link to all the documents they have made available to the public, also include the autopsy report (which no-one other than stuart usher appears to have seen – but he also confirmed in an interview that it did not say what ann and robert claimed it did), the psychiatric report on ann, and green’s original and amended bail conditions. then we can compare what has been said in interviews by ann and robert to what the paperwork actually says. also, ask robert for permission to make available the taped phone conversations between him and mark daly so we can all make up our minds as to what was said in them. Well this is indeed a very sorry state of affairs. I was involved with the Hollie Greig case from the very start long before lowlifes like Steven Milne and George McKendrick jumped on the bandwagon to fuel their own egos. They and others really are the gutter trash of society who should be locked up for a very,very long time. Robert Green is a fantasist, a con-man and a menace to society and the full force of the law should be brought to bear against him. There is no veracity in the stories, there was no abuse ever. FACT. I am grateful to Greg Lance-Watkins for exposing this sham. Greg is a man of intelligence, compassion and integrity although sadly, like myself, he is suffering from serious health problems. hello tom. hope you are doing well. i’m sure you could inform members here of the amount of abuse you had from ‘hollie’s peaceful army’ since you started doubting the story. you (amongst others) went though enough of it for voicing your opinion. believing anything contrary to what robert ‘says’ puts an immediate target on your back, whilst their mass paranoia runs rampant. do you remember when i was even accused of faking a letter that you had written and even when you wrote in reply that YOU had definitely written the letter and included your phone number for anyone to call you about it, they still would not believe it? i see they are still accusing you of being a spy for the government…. It was later discovered, through intelligence research, that GLW had fellow cohorts operating with him such as blogger alias Anna Racoon (solicitor and former employee of the secret Court of Protection) and alias Tom George, a man with more identities than a Russian doll, found to have worked out of an EU Government building in Paris. ‘intelligence’ and ‘research’ are two things that have been conspicuously absent in this case!